I have ran an evac for a few years now and wouldn’t run without it. Much easier oil change. So many better ways to spend $. What gains do you get from an evac? zrt-racing wrote: So many better ways to spend $. 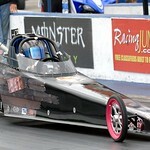 Well if we were looking for smart ways to spend money, we wouldn't be drag racing! LOL. But the evacs make oil changes a little easier. There is no catch can to drain. And the oil you put in the engine at the beginning of the day is the same amount at the end of the day. Nobody says you need to have them. But they are slick. We could write our dial ins with shoe polish too. But there a better and worse things to spend our money on within our lovely sport !! Our oil changes are easy and we have never put an evac on. As far as catch can draining ... once you know your oil amount your engine likes, you will not have much of anything to drain. If my engine likes 11 oz... I know as it will puke out anything over that... with the evac you will never know. If my engine is sending excess oil on a race day...i want to know as there is a reason why.. with the evac you dont get that info. I could go on all day as to why these are a complete waste of $ and space on our jrs. As far as painting your dial on... I assure you that has nothing to do with your evac..
Love out Blossom evac systems. Have them on both cars. Is it a need? Absolutely not. There are certainly better places you can spend your money to gain performance or ET if you have to choose. That being said, it works for us. I swapped out the puke tank in the back for a weight tank which makes staying on an index easier for me. I also love changing the oil without a funnel. It made the oil change so easy, the kids have been doing it on their own since they were 10.